Proper Orange’s address is 686 Massachusetts Avenue, Cambridge, MA 02139. 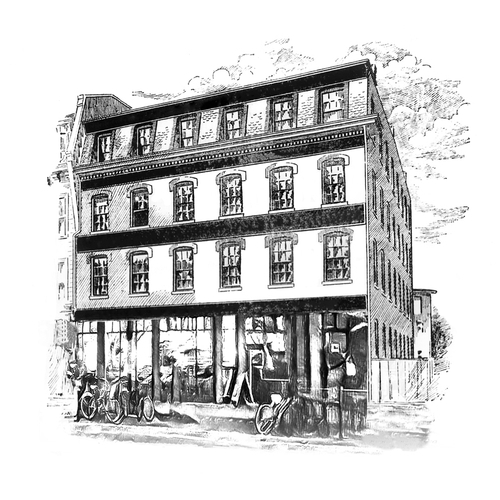 Roughly halfway between Harvard and MIT, our office is in one of the oldest buildings in Central Square. It started as a factory where artisans crafted pieces of furniture. Today it is home to some of the most creative minds in the City of Cambridge: A portrait photographer whose work has been featured on the cover of The Atlantic and an artist whose sculptures have appeared in renowned restaurants, like Cuchi Cuchi in Cambridge are just some of the tenants. Do you work with people outside of the metro Boston area? In general, yes. We’re comfortable working with teams around the globe, and are experienced in coordinating workplans both through asychronous project management tools and on various video chat platforms. However, we recognize the value of in-person connections, and prefer to have periodic face-to-face meetings with at least one team member if possible. I really like the coffee at your office. Where can I get more of it? Our coffee is cheerfully provided by Beantrust. Erik is a kind, considerate part of our local community—and his coffee is awesome, too. I love your office space. Is there any way to rent it? Our meeting/event space is available to rent on Peerspace. It is fully equipped for meetings, receptions, conferences, workshops, lectures, and other events. Amenities include high-speed wireless internet, projector, white board, large flatscreen monitor/smart TV, color and b/w printing, coffee, tea, communal kitchen, and indoor bike parking. For software development, what is your preferred stack? Above all, we believe in using the best tool for the job, and not letting dogma limit our capacity to provide excellent results in the full complement of web and mobile technologies, from Python to iOS to AngularJS to Google Glass, and just about everything in between. But if given a choice, we prefer Python and Django, the web framework for perfectionists with deadlines. I provide services to businesses and I like your approach. How can I join the Proper Orange team? We love meeting smart, talented, like-minded people. Due to our highly collaborative approach, we’re selective in expanding our team. Contact us to start the conversation and see if we’re a good fit for working together. What happened to all the nice fun facts from the old website? Proper Orange is located so close to the last subway car on the Red Line that you can come through our door without getting snow on your boots. A mural of the periodic table of programming languages is on our wall. If you can guess Andreas's favorite programming language prior to entry, you get an espresso. Cold brew coffee from Beantrust is delivered during the season. The Proper Orange office does not contain a foosball table, ping pong table, or any other type of table with balls. The Proper team considers this our workplace. When you visit, you might hear Jeff Buckley, Nina Simone, or Tori Amos playing in the office. If it’s a Thursday, you can bet money you’ll find a lot of our team members hanging out on the floor of Venture Café having a glass of wine. Proper Orange does a lot of pro bono stuff – because of the parties! No rock star developers here; nobody wants their hotel room trashed. (Ninjas need not apply either.) We're keeping it real.